Our Odyssey: We bought a boat! OK, more accurately, we have a contract to buy a boat, which is subject to our acceptance upon survey and sea trial. This week has been a whirlwind of activity, and I'm exhausted. I'm taking today off from any visits or meals out, and after I have had a chance to catch up on the blog and email I might get around to some projects around the house. I am not entirely sure what possessed us to make an offer on a boat the Monday before Thanksgiving. We've been ruminating about this boat for several months; we first noticed it on the market in July, just ten days after it was listed, and we rented a car to go see it. As I wrote here at the time, it was priced too high for us to really consider it, but we put it on the watch list, knowing the price might well come down after it had sat unsold for a few months. Sure enough, less than three months later, the seller dropped the price 10%. Still not where we needed it to be, though, so we decided to wait and see if another price reduction might be in store, leaving open the possibility that it might be purchased out from under us. We were OK with that, because this boat was not really the boat of our dreams, but still a good compromise that ticked off almost every check-box on our must-have list. Importantly, it is the newest of all the boats we've seen, at just under ten years old. In the ensuing months, the boat continued to grow on us, and several friends in the boating community suggested strongly that rather than wait for a price drop, we should just make our best offer whenever we were ready. The thinking being that the seller might well turn us down up front, but after the boat sits unsold for another few months, with ongoing expenses and the other pressures of life, the seller might well call his broker back to ask, "Are those folks who made an offer still interested?" Sitting here in the bay area for the past six-plus weeks, checking the boat market daily, we slowly came to the conclusion that the time was right for a low offer to be seriously considered. What clinched the timing, though, was learning that our technical consultant, without whose serious inspection we would not be comfortable buying a one-off custom boat, was only available the week of December 17th, or else not until February at the earliest. Even though our broker told us there was no rhyme or reason to the market around the holidays, we also felt that this time of year might also make a seller more receptive to offers on a boat that had been sitting unsold since the summer. Thus it came to pass that we called the broker on Saturday and asked him to write the offer. Ensuring we had the deposit ready to wire meant waiting until Monday to submit it, and we gave the seller until Wednesday to respond. Frankly, I did not think we were going to head into Thanksgiving with a signed contract. We offered just 81% of the asking price, which the seller rejected Wednesday morning, countering with 94%. We told our broker our absolute top was 83%, and we figured it would end there, at least until the seller had a chance to sit through the holiday season with nary another looker. So my jaw dropped when the broker called me back just 20 minutes later to say the seller had accepted. I felt like the dog who chased after the bus, with no clue what to do once he caught it. I'm sure you'd like to hear more about the boat. I will be posting many more details once we've accepted the boat and the deal is complete -- regular readers will remember that we came very close once before, only to have the boat fall dramatically short on some technical issues. However, I will share here the key points. The boat is a one-off custom build, with a steel hull and aluminum superstructure, completed in 2003. She's 52' long, 15' wide, and displaces (weighs) 85,000-100,000 pounds, with a tonnage of 66 Gross, 52 Net Registered Tons. She's propelled by a single 300 horsepower diesel driving a conventional propeller and shaft ahead of a skeg-hung rudder. A bow thruster allows for easy maneuvering of the single-screw boat at the dock, and hydraulic active-fin stabilizers minimize rolling at sea. With 47.5 feet to the waterline and a full-displacement hull, she has an absolute top speed of 10 knots (11.5 mph), and a cruise speed of 8 knots. With 3,300 gallons of diesel fuel, her range at 7 knots is better than 6,000 nautical miles, more than enough to cross the Atlantic or Pacific oceans. With a draft just under 5'10", she can traverse the Great Loop and make into most (but not all) of the nice anchorages in the Bahamas. Below decks are two staterooms, each with a queen berth (bed) and en-suite head (bathroom). Aft of the midships master stateroom is the engine room, accessed by a full-height watertight door. 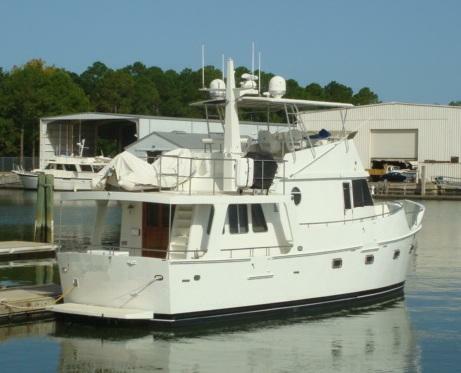 On the main level are the modern and well-appointed pilothouse, the galley, and the salon. On the upper deck is a flying bridge (outdoor control station), seating area, and storage for the tender and our two scooters, with a 1,000-lb crane for loading and unloading them. While the timing was, apparently, excellent for having our offer accepted, it could hardly be worse for nearly everything else. One of the keys to having the offer accepted was a fast closing, and so we need to sea-trial the boat the week of December 17th, and close the deal by mid-January. Of course, the boat is on the east coast, and here we are in California. The good news is that my cousin's family, on whose arrival we have been waiting, will be here December 1st, so we will get a chance to spend some time with them and get them settled in to their temporary apartment -- though it is looking unlikely that the house they are buying will close before we have to leave here. As part of helping them with their very disruptive move across country, I had offered to fly to New York, and drive their elderly dog to California in their car, as flying the dog in cargo was judged too risky. Absent the whole boat deal, I would have made that flight on Sunday the 2nd, arriving back here a week later. With surveys and sea trials planned now for the week of the 17th, we are instead thinking about parking the bus, and flying to New York together around the 14th. We'd get the dog and the car, then drive to Georgia to do the surveys, setting off for California the morning of the 20th. That would put us back at our cousins' apartment in Oakley late on Christmas day. We'd have only a couple of days, then, before we'd have to be back on the road to make the closing mid-January. A tight schedule, to say the least. Catching up on the last couple of weeks, we've been bouncing around the same industrial neighborhood in Menlo Park (map) since my last post, moving the requisite two-tenths of a mile every three days. We like it here -- it's close to many of our friends, and with so many vacant buildings in the neighborhood, it's quiet and relaxing. I did have to drive over to Trailer Villa last weekend to use their dump station, for a whopping $20. (By contrast, we could have spent the night at the Fremont Elks for just $18, including power, and the dump station is included.) At that price I put every last ounce of water into the tanks that would fit. Worth it, though, as we only had to travel a mile or so round-trip from here. Next time we'll try Docktown marina, another exit north on 101, as I've heard their dump is just five or ten dollars. Today I will be working on installing WiFi and cellular amplifiers, technology we really purchased for the eventual boat (before we decided make the offer), because our current satellite solution will no longer be an option. We thought we'd get the gear while we had a good delivery address here (plus access to Fry's), and set it up on Odyssey to get some experience with it before we needed it for real. Had I known we were this close to a contact, I might well have waited until January. Over the weekend I need to get cracking on finding a marina where we can park the bus nearby while we transition to the boat, and finding long-term storage for the bus. We'd really rather sell it than store it, but below a certain price, it's worth more to us to keep it as our occasional land-based digs than to sell it, and the market is very soft. That said, I'll also be writing up some listing copy, on the off chance that someone else will value the highly specialized design of Odyssey. CONGRATS. We also own a trawler and motorhome so join the club. We will watch your transition to the boat. Good luck. Your transition from Odyssey to the boat will make for great reading, there was a time that a trawler was our choice of retirement homes but the world changes. Who knows it may change again so I will be watching closely. "I felt like the dog who chased after the bus, with no clue what to do once he caught it." Love it! CONGRATULATIONS!!! WOW, how exciting! This should make great blog reading. I am so happy for you. Way to end the year with a big life changing event. I look forward to hearing more about the boat. Congrats, Sean and Louise! Hoping to meet you in Galveston some time. Congrats you two! Your patience has really paid off. Get ready to really spend money guys. I looked it up on Yachtworld - looks like a really well spec'd boat. I hope it trials well for you but considering its age I suspect it will. I didn't see any mention of a "get home" drive in the specs but otherwise I can't imagine what systems you would need to add. I don't know what your intentions are for nav software and you may already know about this but if not, check out http://opencpn.org/ocpn/ Its really good software with a dedicated development team that keeps improving it and best of all, 100% free to use. If you never cruise outside US waters your charts are also 100% free just because your government is better in that regard than ours. Again congratulations and get ready to really spend some serious money. 3300 gallons of Marine Diesel! Yup, that's gonna put a dent in the account. Our update is that I will fully retire at the end of the year and hopefully I can finally wrap up this never ending truck conversion project so in '14 we can cover some of the same highways you two have so eloquently described over the years. Pat is still showing dogs and for the fifth year our younger Samoyed has been invited back to the AKC Invitational’s in Orlando in Dec, so that will be our '12 celebration. Wow! Congratulations on your traveling evolution. Good Luck! Congrats on the boat. Looks great. I'm curious that you chose a single screw instead of twins or are most of these trawlers single? Hope you have good luck selling the Coach. There is some inside storage in caves that someone was offering. You would have to Google it. Many trawlers and especially ones designed with ocean-crossing in mind have a single screw, because they are more fuel efficient. Most of the world's large cargo ships are also single-screw for this same reason. A single screw is also easier to protect from damage by extending the keel into a skeg. That said, we did not get into the twins-vs.-single debate. We decided fairly early in our process that other factors would drive our decision, and whether the boat had a single or twins did not matter to us, so long as the boat had sufficient range and backup systems. It just happened that we ended up with a single. Congrats! I cannot wait to see inside and follow your adventures at sea! Boats are great but unforgiving you have so many things that can go wrong on the water. Cruising along and strike a submerged item and you could lose the entire thing. Really got to do your homework when you decide on where to go. Weather reports plotting etc you have to know a lot more than the average motor-home user. But the territory is so vast for a boat.